Cut open the Tuna Tin and drain all the water. Mash the boiled potatoes. Add the tuna to the mashed potatoes. Mince all the green masala add to the mixture. Add all powders, salt and yolk of egg (reserve the white of egg) and mix together. Make small balls (if there is excess water, add bread crumbs). Form cutlets in the palms of your hands. Beat the white of egg. 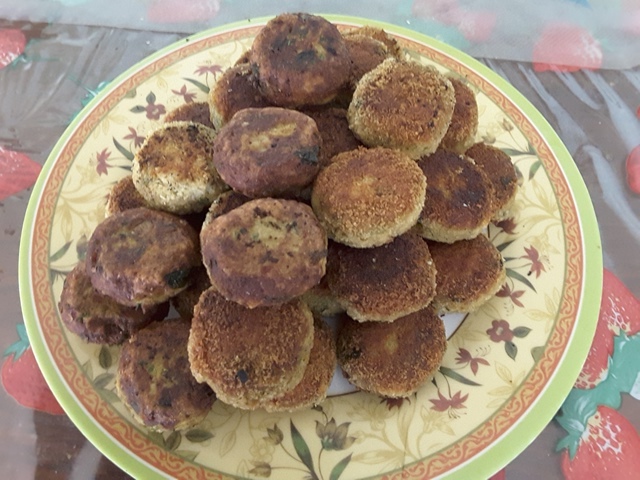 Dip the cutlets in white of egg and then Bread Crumbs (if you want crispy cutlets) or only white of egg. Heat frying pan, add about 6 tbsp oil and shallow fry the cutlets on both sides. Remove to a paper towel to take off excess oil. Clean the Mackerels (see Video), Cut them into required size pieces (2 or 3) apply ½ tsp of salt and keep aside. Place a deep pan or vessel on stove. Add ghee or oil, when hot add ½ sliced onion. Fry for a minute, add curry leaves. Fry for another minute and add the ground masala. Fry for 10 minutes, add masala water if it dries up. Now add the remaining masala water and more water if required to make gravy. This should not be too thin. The gravy will increase when you add the fish (water from fish). Now add 1 tsp salt and the Mackerel Pieces. Boil for 3 minutes or until fish is cooked. Check for salt and gravy requirements. Remove from stove. 400 gms tomatoes or one can of diced tomatoes. Clean the Mackerels (with Pockets along the bone- see video) or Sardines, apply ½ tsp of salt and keep aside. Heat a deep pan and add olive oil. When hot add the Onions. Add 1/2 tsp of salt. Fry till the onions become slightly brown. Add the ginger, garlic, chillies. Fry for 3 minutes. Add the chilli, turmeric, salt and vinegar or salt & chilli paste. Mix well and add tomatoes and mix well. Fry for 5 minutes. Pre-heat Oven at 180 degrees for 10 minutes. Take a deep baking dish or roasting dish. Add one portion of the cooked masala to the dish. On top of it place the Mackerels or Sardines. For Mackerels fill some of the masala into the pockets which were created. 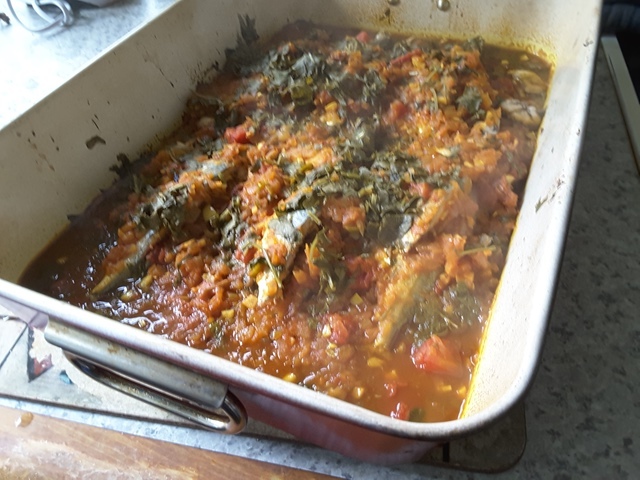 Put the rest of the masala on top of the mackerels or sardines. Sprinkle the coriander leaves on top of the fish and then sprinkle the lemon juice on top of the fish. Close with lid (sealed) or aluminium foil. Place some water on top of the lid. Bake for 30 minutes. Clean the mussels under water and take off the beard if any. Scrub off the direct and wash them. If any of the mussels are already opened, tap them and see if they close. If not throw them away. Wash the mussels and then steam them in a little water. Place water in a vessel and the mussels in a colander over the water. When it steams the mussels open. If they do not open throw them away. You can also steam them in a little water with the lid of the vessel closed. When steam starts escaping from the lid the mussels would have opened. Use the stock for soup. Open the mussels and then discard one of the shells. Remove the meat from the other shell, remove any beard or dirt and place it back in the shell. Do this for the rest of the mussels. In a bowl pour half a cup of the Mayonnaise and add 2 tablespoon of Shiracha chilli sauce. Add 2 tablespoon of chopped green onion or spring onions. Mix well. Place the half shell mussel either fresh or packaged one’s on a baking tray. Pour in one tablespoon of the sauce on top of each mussel. Place the tray under a grill in the oven. Grill at 180 degrees for about 10 minutes. Remove and serve with lemon wedges. Place the butterfly prawns in a baking tray. Drop little of the paste into each of the prawns. Preheat oven 250 degrees and grill the prawns for about 5 minutes. Remove and serve, garnish with parsley or coriander leaves. Mix well to coat the prawns. The batter should not be thin. In a deep pan, heat sufficient oil to deep fry the prawns. Do not overcrowd the pan. Fry in batches. Fry till the prawns are golden brown. Place the fried prawns on paper towels to absorb oil. In a serving plate, place the fried prawns on one side to take up 3rd of the plate. Slice an onion very thin and spread the slices on the ¼ part of the plate. Slice a couple of green chillies and place them on top of the onion slices. Sprinkle pinch of salt and lime juice on the onion and chilli slices. Sprinkle little lime juice on the fried prawns and if you have, sprinkle some chaat masala (powder) on top of the Fried Prawns. A very good appetizer!! Enjoy!! Cut the fish into big pieces and then boil in little water along with a little turmeric, salt and pepper powder. Remove the fish and reserve the gravy for the bread. Mash the boiled potatoes. Flake the fish with a fork and add the fish to the mashed potatoes. Mince all the green masala. Broil the green masala and add to the mixture. Soak the bread in the gravy (the water in which fish was boiled). Squeeze out the water, break the bread into pieces and add to the mixture. Add egg, vinegar, powders, salt, and sugar and mix together. Make small balls (if there is excess water, add bread crumbs). Form cutlets dipping in bread crumbs – on a cutting board, using a broad knife and your other hand to shape them. Heat frying pan, add about 1.5 tbsp oil and shallow fry the cutlets on both sides. Remove to a paper towel to take off excess oil.